Credit-card processors are mostly responsible for data transmission and security when you use your card at a store or online to make a payment. There are two types of processors in the payment-card system. Front-end processors route transactions from merchants to the cardholder's bank to gain authorisation. That is, they make sure a customer has enough available credit or funds to make a purchase. Back-end processors are responsible for a fund's settlement, which ends with the merchant receiving a deposit for transactions. Below, we've outlined the major players in credit-card processing and described their major strengths. Bank of America Merchant Services has the advantage of functioning within the second-largest bank in the US. The service promises acceptance of all kinds of payments (credit cards, debit cards, electronic cheques and gift cards), access to funds on the next business day, and mobile support. The consumer division of Citigroup processes transactions in more than 100 currencies. It offers end-to-end processing services, from pricing to transactions, reporting, customer service and billing. One of the "Big Four" US banks, Wells Fargo offers next-business-day funding, encryption and tokenization technology, and support for both PIN and signature transactions. 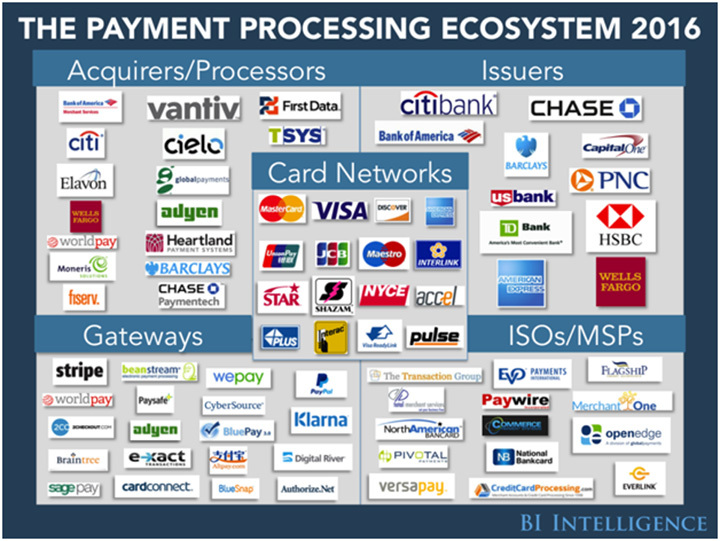 This is the payment-processing arm of JP Morgan Chase, the largest bank in the US. Chase Paymentech authorises and processes payments in more than 130 currencies. And like its peers, it offers analytics, fraud-detection and security solutions. Barclaycard payment solutions facilitates in-person, phone, online and mail-order purchases through desktop and portable card machines. Vantiv has been successful thanks to its nearly error-free purchases, authorisations and captures. In May 2015, it successfully completed 95% of these transactions, beating competitors such as Worldpay, PayPal and Braintree. The company also has a significant speed advantage, as it often processes payments data in less than a second. First Data facilitates small business payments with its Clover suite of products, including a mini-reader that works without Wi-Fi and a mobile reader that attaches to other devices in order to process payments on the go. Cielo is the largest Brazilian credit- and debit-card operator and the largest payment-systems company in Latin America. The company debuted on the Sao Paulo Stock Exchange in 2010. Short for Total System Services, TSYS supports millions of buyers and sellers around the world through four major branches: issuing services, acquiring services, prepaid solutions and merchant solutions. Global Payments focuses on ensuring businesses accept all major forms of payment. To that end, its services include credit/debit/purchasing cards, electronic-cheque conversion, money transfers, verification and recovery services, gift/loyalty cards, cheque guarantee, ACH checks, financial EDI services and point-of-sale equipment. in-store channels. As of August 2016, the company had 400,000 merchant clients. In 2015, it processed 13 billion transactions valued at more than US$526 billion. Worldpay has grown its volume primarily because of early-mover advantages that have allowed it to increase in scale. It also provides many different services across different channels, which diversifies its revenue streams. Moneris is the largest credit- and debit-card processor and acquirer in Canada. It processes more than three billion transactions each year for more than 350,000 merchants, and the company employs more than 1,900 people in North America. In October 2015, American Banker and BAI both ranked Fiserv third by revenue among technology providers to US banks. Fiserv provides services in account processing, electronic-payments processing, cheque processing, web and mobile banking, and more. full-stack gateway and has famous merchants like Facebook and Spotify as clients. The company has brought in merchants thanks to its single platform that can support payments in any channel across 100 different payment methods and 200 countries. The firm processed US$50 billion in 2015, up 100% from US$25 billion in 2014. It earned US$350 million in revenue in 2015, and expects to break US$500 million in 2016. Heartland helps businesses move beyond accepting major credit cards. The company facilitates payment processing in-store, online and offsite through multiple methods, such as EMV, Apple Pay, Samsung Pay, Android Pay and gift cards. It also offers next-day funding, real-time reporting and 24/7 customer service in the US. Formerly known as NOVA, this company is a subsidiary of US Bancorp. Elavon processes payments in more than 30 countries for more than one million merchants.